Putrajaya , officially the Federal Territory of Putrajaya, is a planned city and the federal administrative centre of Malaysia. The seat of government was shifted in 1999 from Kuala Lumpur to Putrajaya, because of overcrowding and congestion in the former. Kuala Lumpur remains Malaysia's national capital, and is the seat of the King, the Parliament, and all the foreign embassies, and the country's commercial and financial centre. Putrajaya was the idea of former Prime Minister Mahathir Mohamad. It became Malaysia's third Federal Territory, after Kuala Lumpur and Labuan, in 2001. Putrajaya used to be Prang Besar ('ڤراڠ بسر), and was founded in 1918 as Air Hitam by the British. Its land area of 800 acres (3.2 km2) d expanded to 8,000 acres (32 km2), and it was merged with surrounding estates, including Estet Raja Alang, Estet Galloway and Estet Bukit Prang. The vision of a new Federal Government Administrative Centre to replace Kuala Lumpur as the administrative capital emerged in the late 1980s, during the tenure of Malaysia's fourth prime minister, Mahathir bin Mohamad. The new city was proposed to be located between Kuala Lumpur and the new Kuala Lumpur International Airport (KLIA). Two areas were proposed: Prang Besar and Janda Baik of Pahang. The Federal government negotiated with the state of Selangor on the prospect of another Federal Territory. In the mid-1990s the Federal government paid a substantial amount of money to Selangor for approximately 11,320 acres (45.8 km2) of land in Prang Besar, Selangor. As a result of this land purchase, the state of Selangor now completely surrounds two Federal territories within its borders, namely Kuala Lumpur and Putrajaya. Planned as a garden city and intelligent city, 38% of the area is reserved for green spaces in which the natural landscape is enhanced. The plan incorporated a network of open spaces and wide boulevards. Construction began in August 1995; it was Malaysia's biggest project and one of Southeast Asia's largest, with an estimated final cost of US$8.1 billion. The entire project was designed and constructed by Malaysian companies with only 10% of the materials imported. The Asian Financial Crisis of 1997/1998 somewhat slowed the development of Putrajaya. 300 members of the Prime Minister's office staff moved there in 1999, and the remaining government servants moved in 2005. On 1 February 2001 Prime Minister Mahathir declared Putrajaya as a Federal Territory in a ceremony by which Putrajaya township was handed over from the Selangor state authorities. In 2002 a rail link called KLIA Transit was opened, linking Putrajaya to KLIA in Sepang. However, construction of the Putrajaya Monorail, which was intended to be the city's metro system, was suspended owing to high costs. One of the monorail suspension bridges in Putrajaya remains unused. In April 2013 the Putrajaya government signed a letter of intent (LOI) with the government of Sejong City in South Korea to mark co-operation between the two cities. 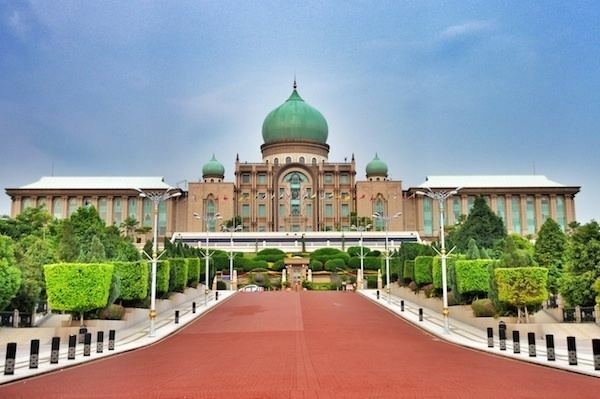 As of 2012 almost all of Malaysia's governmental ministries had relocated to Putrajaya. The only ministries remaining in Kuala Lumpur were the Ministry of International Trade and Industry (Malaysia), Ministry of Defence and Ministry of Works. Alamanda Shopping Centre, located near the governmental ministries in Precinct 1, was opened to serve people who work, play and live in Putrajaya. In 2007 the population of Putrajaya was estimated to be over 30,000, which comprised mainly government servants. Government servants have been encouraged to relocate to the city through a variety of government subsidy and loan programs. The population had increased to 88,300 by 2015. As of 2010, the population of Putrajaya is 97.4% Muslim, 0.9% Christian, 0.4% Buddhist, 1.0% Hindu, 0.2 % unknown and 0.1% other religion. Government Pre-School (Pra-Sekolah) located in Primary School. Heriot-Watt University (Heriot-Watt University Malaysia) has a campus in precinct 5. Putrajaya is surrounded by federal highways 29 on the western side and 30 on the eastern side. The South Klang Valley Expressway E26, connecting Pulau Indah to Kajang, runs through the northern end of Putrajaya. ELITE E6 exit 607 serves Putrajaya and also nearby Cyberjaya. Highway 29 interchanges with Damansara–Puchong Expressway (LDP) E11 in the northwestern corner of Putrajaya, linking the city with Puchong, Subang Jaya, Kelana Jaya and all the way to Kepong. Sungai Buloh-Serdang-Putrajaya MRT Line is currently being constructed and will also connect to Putrajaya Sentral as well. Kuala Lumpur–Singapore High Speed Rail will also connect to Putrajaya along the route from Kuala Lumpur to Singapore, but will be located right outside the borders of Putrajaya, nearby Presint 14. Putrajaya is represented in the Dewan Rakyat of the Malaysian Parliament by Tengku Adnan Tengku Mansor of UMNO, part of the Barisan Nasional ruling coalition. Tengku Adnan is also the Minister of Federal Territories. Being a Federal Territory, Putrajaya does not have a state assembly, and the constituency is not divided into any state seats.